For the arcade and Dreamcast game, see WWF Royal Rumble (2000). 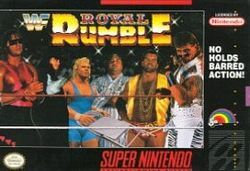 WWF Royal Rumble is a wrestling game for the SNES and Sega Genesis. Each version features twelve wrestlers, some of which are exclusive to one version. This page was last edited on 11 May 2016, at 17:00.